One of the most famous weapons of World War II: more than one million had been made by 1945. Schmeisser. its manufacturer, probably had no part in its design. 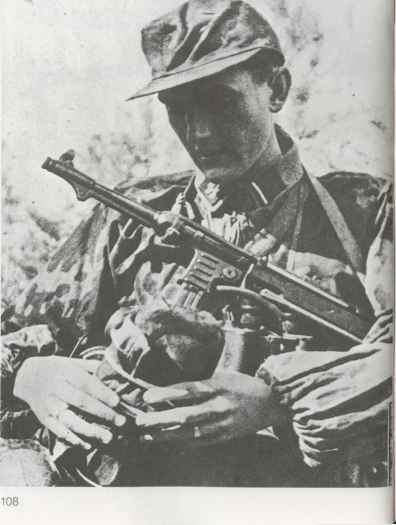 In spite of the success of the Bergmann in the closing months of World War I, it was not until 1938 and the lessons of the Spanish Civil War that the German Army gave orders to the Erma factory to design and produce a reliable and easily manufactured sub-machine gun, mainly for use by armoured and airborne troops. That same year the MP 38 appeared, the first arm of its type ever to be made entirely from metal and plastic. With its folding tubular metal stock and a receiver of steel tube, it was the first of a family which included the MP 40. This successor was of similar appearance but made more extensive use of pressing, spot-welding and brazing. A safety device was introduced too. it having been found that a jolt was often enough to bounce the bolt and fire a round. Oddly enough the famous Hugo Schmeisser had no hand in the MP 38's design; his factory made the MP 40 and the name stuck thereafter. 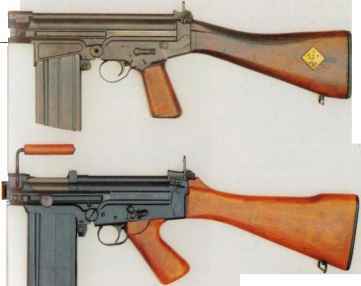 Below left: Loved by German soldiers the MP40 was often preferred by the Allies too. rescue and in capable hands it can match a rifle at 100m. The basic mechanical design follows that of the G3 in which rearward movement of the bolt is delayed by rollers, and like the G3 it has a fluted chamber that lets propellant gas flow past the cartridge case. A curved magazine is now the standard and the gun fires in one of several modes: full auto, semi-auto, or three-round bursts. In addition it has an impressive list of accessories. 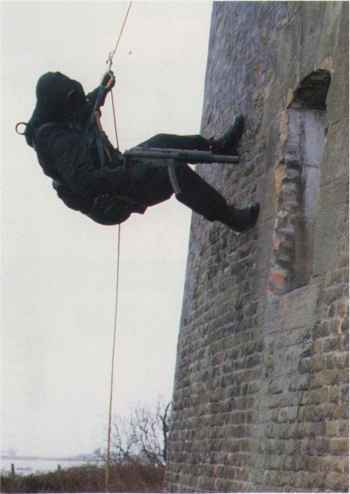 Below: The MP5 is an ideal weapon for hostage rescue, as this SAS trooper demonstrates. Note the cone-shaped flash hider and the somewhat crude forward pistol grip (folding forward beneath the barrel when not in use) of the first Mark of the famous utility weapon of 1941.